If you are need of a more substantial way of keeping your Enduramats together then the 4-way coupler is the product you need. The standard Enduramat coupler works well for light applications but for heavy duty applications nothing keeps the Enduramat locked down like the 4-Way coupler does. The Heavy Duty coupler fixes through any of the Enduramats locking holes. 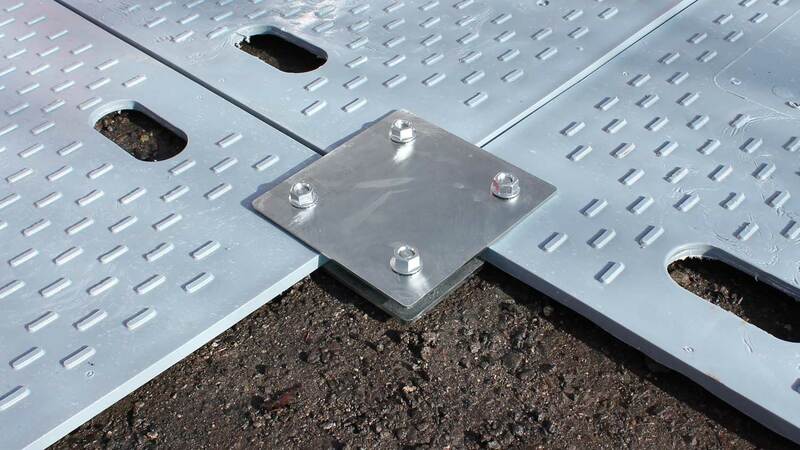 The coupler consists of 4 x M12 studs and two heavy duty steel plates - The mats are sandwiched between the steel plates and fixed with 4 nuts to keep them secured. The 4-way coupler is the ideal coupler if you need that extra rigidity when using Enduramat ground protection mats.